You will need something suitable for moulds either fairy cake tins (make sure you oil these first or they may stick) I like silicon moulds and I used a heart shaped ice cube tray which held 10. 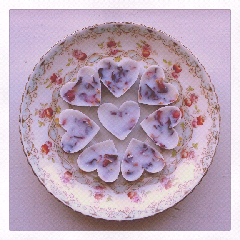 The main ingredients in bath melts is pure cocoa butter and sweet almond oil. You can then customize with different essential oils and petals. Always make sure your chosen oils are non skin irritant. I used pure essential rose absolute which is expensive but a little goes a long way. You may like to change this for Lavender. You can also add petals to your melts. My recipe to make 10 small melts is..
2 table spoons of cocoa butter and 1 table spoon of sweet almond oil, put in a pan over a very gentle heat. Stir until everything has mixed together and has gone clear. Remove from the heat and leave to cool slightly but so it is still liquid then add 15 drops of rose oil and a handful of dried rose petals. (note, do not put oil in hot mix as it will evaporate and you will lose your scent). Pour into moulds and pop in the fridge until set. Then remove and store in a dry place at room temperate. Great for gifts or when ones feeling a little indulgent.